Dave Gray was born in 1941 in Findlay, Ohio. He enlisted in the U.S. Air Force Reserve on June 10, 1959, and went on active duty to attend the Air Force Academy Prep School on July 31, 1959. Gray left active duty on March 18, 1960, and served in the Air Force Reserve while attending the University of Florida from March 19, 1960, to October 12, 1964. He was commissioned a 2nd Lt through the Air Force ROTC program of the University of Florida on December 19, 1964, and went on active duty beginning March 3, 1965. Lt Gray next completed Undergraduate Pilot Training at Webb AFB, Texas, in March 1966, and then went through F-4 Phantom II Combat Crew Training before being assigned to the 497th Tactical Fighter Squadron of the 8th Tactical Fighter Wing at Ubon Royal Thai AFB, Thailand, in January 1967. Lt Gray was forced to eject over North Vietnam while flying his 4th combat mission, and was taken as a Prisoner of War on January 23, 1967. After spending 2,233 days in captivity, Capt Gray was released during Operation Homecoming on March 4, 1973. He was briefly hospitalized to recover from his injuries at Maxwell AFB, Alabama, and then attended pilot requalification training at Randolph AFB, Texas. His next assignment was as a T-39 Sabreliner pilot with the 12th Operations Squadron at Randolph AFB from November 1973 to April 1974, and then with the 3246th Test Wing at Eglin AFB, Florida, from April 1974 to June 1975. Maj Gray then served as a T-39 pilot with the 1402nd Military Airlift Squadron at Eglin from June 1975 to August 1976, followed by an Air Force Institute of Technology assignment to complete his master's degree from August 1976 to August 1978. 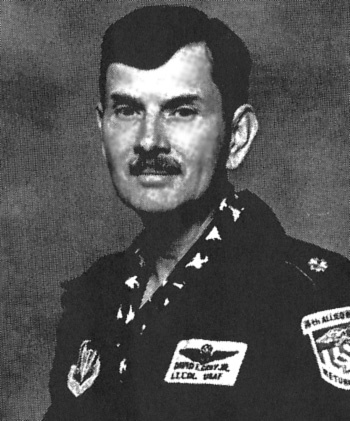 Col Gray served in the Tactical Air Warfare Center's Office of Data Automation at Eglin AFB from August 1978 to May 1984, and then served on the staff at Headquarters Tactical Air Command at Langley AFB, Virginia, from May 1984 to October 1987. He then returned to the Tactical Warfare Center at Eglin AFB from November 1987 until his retirement from the Air Force on March 1, 1993. After retiring from the Air Force, Dave served as Vice President of NAM-POWs from 1993 to 1995, and has served on the board of the National League of POW/MIA Families. Dave and his wife Jean have two sons, Bo and Scott. 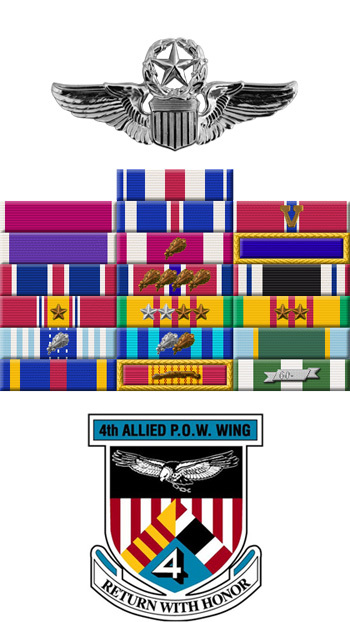 For gallantry and intrepidity in action in connection with military operations against an opposing armed force on 28 January 1967, while a Prisoner of War in North Vietnam. Ignoring international agreements on treatment of prisoners of war, the enemy resorted to mental and physical cruelties to obtain information, confessions, and propaganda materials. Captain Gray resisted their demands by calling upon his deepest inner strengths in a manner which reflected his devotion to duty and great credit upon himself and the United States Air Force.